A decorative Edwardian, cast iron, bedroom combination fire front. The fire front is heavy and solid and has ornate designs with leaf borders and a linear border around the fire opening. The fire has original mantel and fixing lugs on each side and at the back of the mantel. The fire has been blacked and polished and has an attractive finish. The fire does have some slight signs of use and wear, as expected of antique items. There are some visible casting marks along the cross bar and there is a slight chip (please see pictures for details). There are some light scratches and marks. The back of the fire has surface rust. 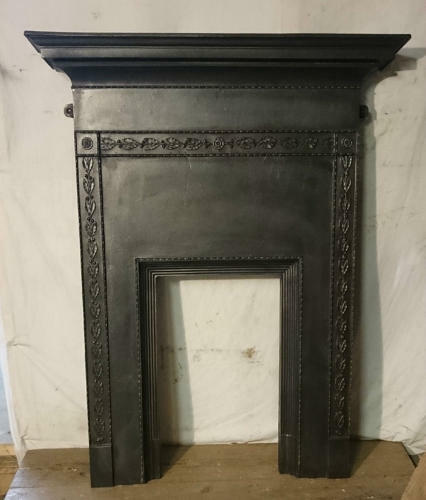 A lovely antique fire front that would add great style to a bedroom or smaller reception room.